Turf then surf – very happy to have found a new route | It's Time To Start Running! Turf as in The Downs, surf as in Brighton seafront. Today was a good run and my personal best so far. I ran 8.03 miles in 1 hour, 3 minutes at 7.58 mph. 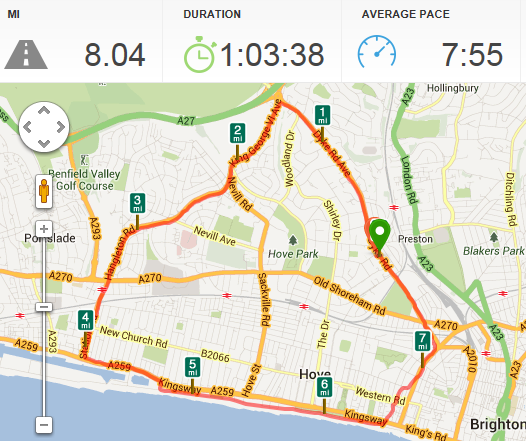 It was also a nice run, a long uphill climb of just over a mile then a bit of countryside and then a long downhill to the seafront. That is really nice to run along but very busy unfortunately. I also noticed I sped up when catching up with other runners, rather than keeping at my usual pace. Maybe that’s a bit of competitiveness I never knew I had! So that’s all for today. I’m off to a party to undo all the good I have just done. « New record average pace, but at a cost?